Welcome to the first episode of the new All Freelance Writing podcast. In the first episode I introduce you to the show and what you can expect moving forward. Then, in line with our ongoing book marketing feature on the blog, I answer a reader question about hiring book marketing professionals to help promote self published books. I introduce myself and share a bit of my professional background to give listeners an idea of what perspective I bring to the show. Background about the show itself is shared so listeners know what to expect. A reader question about hiring book marketing professionals is answered. Book marketing resources are shared for indie authors who prefer the DIY route. I explain how you can get involved by asking your own questions for future episodes (via email, through an online form, or by leaving me a voicemail). Bonus: While not shared in the episode itself, here's another tid-bit. While the All Freelance Writing Podcast is brand new, this is not my first rodeo when it comes to audio shows. Back in 2007 I hosted a live BlogTalkRadio interview show dealing with business and technology (primarily for webmasters and bloggers). While that was a lot of fun and built a regular audience fairly quickly, unfortunately I gave it up before too long due to ongoing technical issues with the BlogTalkRadio platform (though I'm sure they've improved things since then). The last straw for me was when their issues left my listeners hanging for a full 18 minutes at the start of a show. Later (in 2009 I believe), I co-hosted a couple of audio plays with fellow freelancer writer / indie author, Yolander Prinzel. Those were released under the Freelance Theater brand (which this podcast also falls under -- all audio and video I release for writers will as well), and released at AllFreelanceWriting.com, which now falls under the All Freelance Writing brand. To access those old audio plays, visit FreelanceTheater.com. The podcast will cover freelance writing, indie publishing, and blogging (just like the rest of the site). Most episodes will include material related to each of those topics (with exceptions in special circumstances, including this first episode which is a tie-in to the ongoing book marketing feature on the blog). This is a solo show. Rather than running a standard interview-style show, I will occasionally bring in guest co-hosts to have more casual conversations about writing-related issues. Shows will be released bi-weekly (generally on Thursdays, so expect the next episode on November 6th). Shows are expected to fall within the 20-30 minute range per episode. The show format includes an introduction covering any news about the community, then we'll tackle one core issue (a news item or an expansion of something from the blog), then answer any listener / reader questions for the day, followed by at least one recommended resource. "What are the best sources for finding marketing/PR information and assistance for self-published book authors? There are many people claiming expertise, but not many references to support claims. I am interested both in book self-marketing guides, and options for hiring assistance." Below is my general response to Catherine's question. While in line with the podcast response, this is the version I emailed her privately so she wouldn't have to wait for the show's launch. 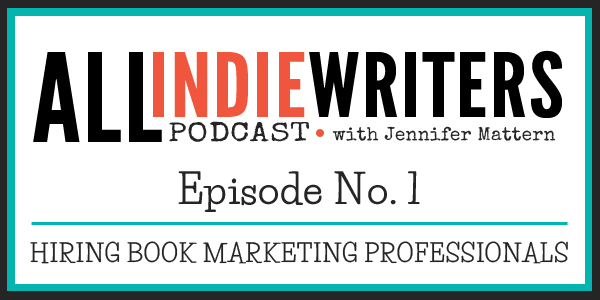 First, let's talk about hiring marketing and PR pros to help you market your book. First, don't take marketing advice from other authors -- unless they're also marketing or PR professionals with expertise that goes beyond promoting their own work. -- Luck, timing, and different markets all mean that what they did will not necessarily work for you. Your marketing and PR should always be custom-tailored to your book and your target readers. When you try to follow the crowd you also run the risk of using tactics that can hurt your reputation (like social media spam, which unfortunately very common in the indie author community). Along those lines, only look for pros who specialize in what you really want. For example, an internet marketing consultant would be able to help you with things like social media marketing and search engine optimization. If you want to launch a media campaign or build visibility alongside a specific image, go with a public relations pro. If you're interested in gimmicks and stunts to drive quick interest more than things like long-term reputation management, look for a publicist (not the same as a PR professional, though there can be some overlap). When choosing a book marketing or PR person to help you, start by checking out their website. Do they list past clients? Do they have testimonials? Case studies? If not, ask if they can share any privately. Consultants who are in heavy demand don't need to brag publicly about past work. They probably already have all the clients they can handle, or at least close to it. But if they're allowed to share information privately and they're taking on new clients, they very likely will. Some intentionally withhold information in order to make you contact them. Their marketing strategy is often to get you on their prospect list for future emails or to try to sell you personally over the phone. I'm not a fan of this approach, but I do prefer to limit public samples (it saves the consultant from client-poachers and it helps to control the flow of prospects). But if information is hard to come by publicly, this might be the reason. Don't expect most consultants to be able to share a lot of details about past campaigns. It's not uncommon for them to be bound by nondisclosure agreements. They might be able to give you general information like who they've worked with or what media outlets they've gotten clients featured in. But they're probably not going to give you so many samples of their work that you could copy the results without them. Along those lines, they're not likely to give you things like their full media lists. One of the best ways you can find reputable marketing and PR pros is to talk to other authors in your network. Find out who they used and whether or not they were happy with the results. If you know the other authors, you're more likely to get details about what the campaign included and what the results were. You should also look into how long they've been in business. If you need someone to run a media campaign, you need someone with more than a few months to a year of experience. New folks probably haven't had time to build real relationships with the media folks they'll pitch on your behalf. Their website might give you an idea of how experienced they are. Look for dates on portfolio materials or case studies. Or at least do a WHOIS lookup (at a site like http://www.whois.net) on their business domain name. When was their website set up? While it's possible they recently rebranded and they've been around much longer than their website, if you see they only appeared online a few months ago, at least you know to ask them how long they've been at it. Also, if you're looking for specialized help (like SEO), you might be better off finding consultants in different ways. For example, you might check industry trade association directories or in the SEO example you might search for firms -- if they're good at their job, they'd better rank well in search engines. If their own site doesn't, they probably aren't competent enough to assist you in that area. One final point: Hiring a marketing or PR professional to manage your book launch for you can be very expensive. A lot of the work they do is time-consuming, and it often revolves around relationships they've spent years building. But you can save a lot of money by bringing in pros only for specific projects. For example, hire a PR pro to draft your launch press release, but distribute it yourself. You might even be able to hire them to put together a custom-targeted media distribution list for your book. Or hire an SEO or internet marketing firm to do an audit of your website and provide suggestions on what you can do to improve search engine rankings or drive more traffic to your website. Then do the grunt work yourself. Or hire a copywriter to help you draft your marketing copy for your website, back cover, etc. Or a PR writer to help you draft press releases and media kit material. You don't have to work with a comprehensive firm if what you really need are a-la-carte services. A classic is John Kremer's 1001 Ways to Market Your Book. I'm a big fan of Peter Bowerman's The Well-Fed Self-Publisher. If you order this one, make sure you get the most recent version (either 2013 or 2014 I believe). While it's about self publishing in general, he has good information in there on getting your books into the hands of readers. I'm a big proponent of building author platforms, and starting early. With that in mind, Create Your Writer Platform from Chuck Sambuchino is a good place to start. Another one that isn't focused on book marketing but which I'd recommend is Nina Amir's The Author Training Manual. I suggest this one because she touches on the issue of market research and target markets -- something many indie authors sadly ignore. But if no market exists for your book (or that market is too small or too saturated), no amount of promotion is going to make it a success. Something else I strongly suggest is to make yourself a true student of marketing and PR if you plan to handle them yourself. Get your hands on a "Principles of Marketing" textbook for example. Learn the fundamentals that apply to any kind of business, and you'll be in a better position to adapt them to your book. The more you understand the fundamentals, the easier it becomes to get creative with them. Email me at jenn@allfreelancewriting.com. Include the phrase "Podcast Question" in your subject line to make sure the email is filtered correctly so I don't miss it. Submit your question through the contact form on this page. Leave me a voicemail by calling 484-575-1345. You'll be directly connected to voicemail. Please note that if you leave a question via voicemail, I might play that voicemail during a future episode if I'm able to answer your question.